Hell hath no fury like a Boltman scorned. 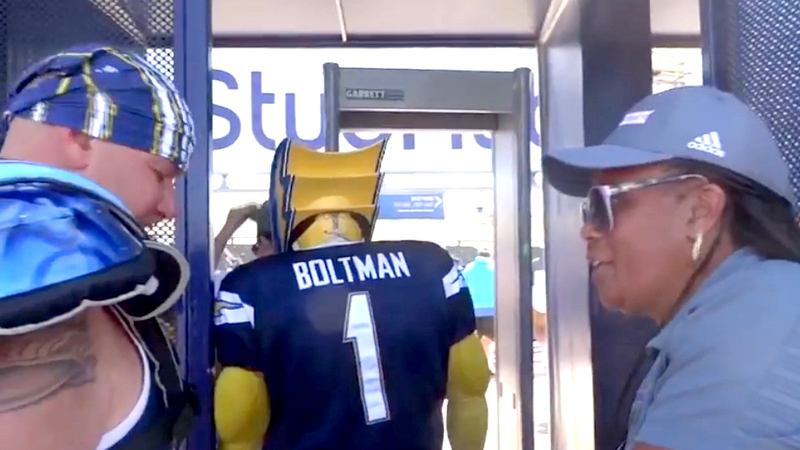 Dan “Boltman” Jauregui, finding a weakness in the Los Angeles Chargers defense, has demanded an apology from the team for suggesting he lied about what he wore into the StubHub Center for Sunday’s game with the Kansas City Chiefs. Image from video shows Dan Jauregui as Boltman passing through security without removing his headmask despite StubHub Center rules. 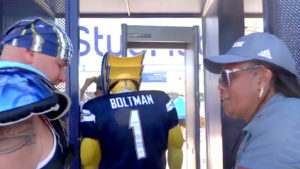 On Wednesday, Jauregui provided video showing him wearing his Boltman mask throughout his entrance into the Carson stadium formerly called the Home Depot Center. “I think a public apology is due from the Chargers for lying and making false statements to ruin my reputation as Boltman,” Jauregui told Times of San Diego. Jauregui — whose gripes against the StubHub mask policy also made “The Turko Files” Wednesday night on KUSI — now is wondering why the Chargers aren’t enforcing rules to keep fans safe. Then he took the team and StubHub to task for letting him go — mask in place — after a 25-minute verbal showdown with StubHub security and Los Angeles County sheriff’s deputies. He said the Chargers were stricter in San Diego.